Power reversal, or the plan of attack. Mhumhi lapped water from the faucet on the tiny sink, his claws scratching the porcelain as he balanced himself on his hind legs. The water had a cool, chemical taste to it, and he realized now that it had been rather different from the water he had drunk during his brief time with the bouda. Theirs had tasted like nothing at all. He pushed the tap off and got down, licking his chops. His back leg was sore again, a sort of aching sore, and it had trembled while he’d had more weight on it. He sat down to lick at it, though it was more of a comfort motion anyway, as the external wound had long healed. He glanced up, tongue sticking out. Kutta was standing in the doorway, looking at him with concern in her eyes. “Oh, it’s never been better,” said Kutta, rather sourly, and turned around to walk with him back to the center of the comforter. Mhumhi saw that two days with three dogs had done more damage than all the weeks with the two hulkers had managed; it was shredded in places from scratching and digging, and there were feathers everywhere. Kebero was in fact working away at one large rip, his head a rooting lump underneath the fabric as he kicked more feathers away with his back feet. Bii was curled up on a shelf above him, looking down at him indulgently. “I’ve told you not to dig in there, Keb,” said Kutta, swishing her tail and very pointedly not looking up at Bii. The fox took the time to yawn and stretch his little paws out. Kebero reemerged, his shoulders all fluffy and his eyes bright, holding something in his mouth. “What do you have there, Kebero?” asked Mhumhi, eyeing the yellow object in his mouth. Kebero shook himself, sending feathers floating everywhere, then trotted over to Mhumhi and let the thing drop at his feet. He went into a play-bow at once, his tail wagging. Mhumhi nosed the misshapen plastic thing and realized what it was: it was Maha’s little yellow bowl, the one she had used to wash his face with once, now chewed into something nearly unrecognizable by the puppy’s teeth. Kebero seemed almost like he was going to ignore her for a moment, for he looked back at Bii, but the fox let his nose hang over the bottom of the shelf and raised his upper lip slightly. Kebero lowered his head, snatched the bowl, and slunk to the opposite corner. “It’s fine,” said Mhumhi, not really wanting to dwell on the matter- it was far too petty. He was rather more disturbed by the silent communication that had gone on between Kebero and Bii. “I don’t see how any plan that takes us back in there is smart,” said Mhumhi. He had meant it as a joke, but Kutta gave him kind of a miserable look. She was interrupted by a loud thump and a squealing whine. Mhumhi flinched. Vimbo had apparently decided to test the door again. “Is it something you have to be taught?” asked Bii, leaning to scratch the back of his head with his hind leg. Mhumhi gave him a dark look, but he could also sense Kutta’s unease, for they were surely feeling the same discomfort. No, they did not need to be taught that living things could be turned into meat. “We could drive him-” started Kutta, but Mhumhi swished his tail. “So, what? Leave him be?” Kutta shot the door an angry look. “Oh,” said Mhumhi, and his heart abruptly sank. “Oh… oh, I think they would…” He swung his head around and stared at the door, a sudden spark of fear entering his consciousness. “But the hulkers are terrible trackers, they couldn’t find him even if they do come back,” said Kutta, though her own eyes had gone a bit wide at the thought. “I don’t doubt it,” said Mhumhi. “Perfect,” she said, her eyes flashing, and let her jaw hang open in a fierce smile. “Perfect?” stuttered Mhumhi, putting his ears back at this unprecedented reaction. Kebero and Bii seemed startled too, Kebero lowering his head and going a bit bug-eyed. “Use the…?” Mhumhi found he wasn’t following. Kutta began to pace, her tail waving slowly. Mhumhi jumped, for that had been Bii’s voice, from right next to him. Apparently at some point during their conversation the little fox had seen fit to jump down from the shelf and creep closer to them. Mhumhi drew a little further back, feeling himself go stiff. He found himself at a loss for words. He saw discomfort flicker through her expression, looking at him, and then she shook herself lightly. “A couple hundred isn’t bad,” said Kutta, pacing, “especially if the police send a large force… they’ll want to catch or kill them, no doubt. Maybe they’ll even try to speak to them at first.” She snorted. 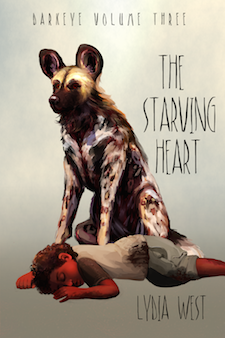 Mhumhi had a sudden horrible vision- Danai descending down to the misty red pit, her hands spread, speaking Dog- and what those dogs would immediately do to her. He had been their prisoner, and they had lied to him again and again, but… They had expressed a desire to negotiate with words. Sending the police down there would erase that possibility forever. His discomfort must have been palpable to Kutta, for she seemed to avert her eyes from him as she continued to speak. “They might see us,” Mhumhi pointed out. She looked around at all of them, triumph evident in her bearing. Kebero began to wag his tail tentatively in the corner. Kutta’s eyes flashed at him, but Bii spoke up. “I…” Kutta put her ears back. “It isn’t a perfect plan,” piped up Bii. “That’s granted, but any plan is bound to have holes. I think Kutta’s right about one thing- the police would be far more interested in meat and hulkers than arresting any of us. In fact, I’m willing to go and tell them myself. I’m confident in my own ability to escape larger creatures.” His face wrinkled into that implike grin. “I’m not sure sending you alone is the wisest idea,” said Mhumhi, and Bii gave a little laugh. There was an uncomfortable silence in the room for a moment. Mhumhi felt Kutta’s gaze shift from him to Bii, for she, no doubt, was wondering the same thing regardless of her plan. Kebero was watching them, though, his ears pricked, his gaze flickering between the two of them, the shredded yellow bowl still wedged in his paws. Mhumhi’s first impulse was to want to reply, And you haven’t got one now, to such a blatant attempt at manipulation, but he held himself back and took an uncertain look at Kutta. She did not meet his gaze, merely stared fixedly ahead out at the wall. He felt a little pang; they were not quite a united front right now. “And what is that?” asked Mhumhi. For an answer Bii stayed quiet and looked at the door. Mhumhi became aware again of the noises he had very nearly been able to block out: the sounds of Vimbo scratching and whining, still not giving up. Mhumhi shot her a glare, his tail tucked underneath him. Bii had successfully outmaneuvered him, and he hadn’t expected that it’d be done with her help. “I’m opening the door,” said Kutta, and she reared up and pulled the handle.